BE A PART OF IT ….. Your support for preserving the memory of the last true United States Navy fighter aircraft is crucial! 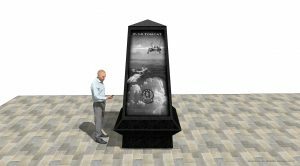 The F-14 Tomcat Monument will be a 10-ft. tall, four-sided, black granite obelisk installed in the Naval Aviation Monument Park on 25th St. adjacent to the Boardwalk in Virginia Beach, VA.
April 2019 SITREP: Donations continue to roll in – THANKS to all who have donated so far! We are waiting for the obelisk granite to arrive so that etching may begin. Planning for the Spring 2020 installation and dedication has begun. 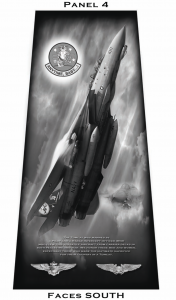 You may have someone you wish to honor or memorialize who was associated with the F14. 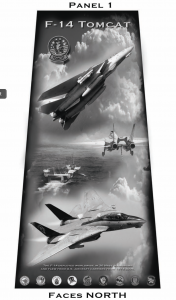 This is also a perfect gift for your favorite Tomcat fan. We need your support – if you are planning to donate, now is the time!! “We have inaugurated a serious undertaking to erect monuments to the F14 Tomcat we were all proud to fly and learned to love as we operated that glorious machine in peace and in war. To that end we have established the F14 Tomcat Monument Association here in Virginia Beach to solicit revenue to fund a project to memorialize not only the airplane but also the aircrew and maintainers who dedicated themselves to the airplane and its mission. 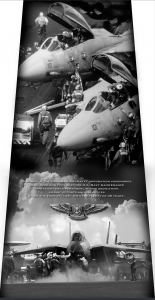 Special recognition and tributes will be given to those who gave their lives while flying the Tomcat. I am pleased to say that we have gotten off to a rousingly good start. Our intent is to erect the first monument at the Naval Aviation Plaza in Virginia Beach within the next year with follow-on sites under consideration in Pensacola and San Diego. In some way all of you contributed to the success of the F14 program, and all of you need to have your association with the program recorded for posterity. 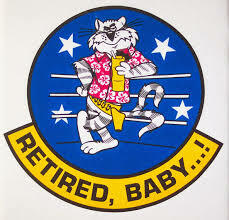 What we are proposing to all of you and the thousands of other Tomcat veterans is an honorable way to have your efforts recognized. Please make that positive decision to help us make it happen. 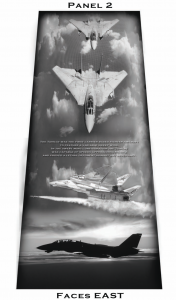 Laser-etched storyboard panels similar to those shown below will display images of the iconic variable-sweep wing fighter, as well as descriptive text that will be visible on all four sides of the obelisk. 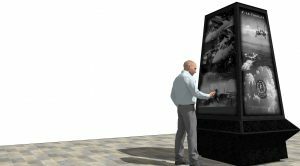 The panels will depict aircraft operations, a tribute to maintenance and operational personnel, and a commemoration of those who gave their all flying the Tomcat, including their names inscribed on the monument. The Tomcat Monument will be funded by donations (made in US dollars) online via credit card through PayPal or by mail using the flyer below with a check to the F-14 Tomcat Monument Association. 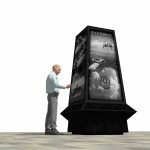 ALL AFTERBURNER, MACH 1 and MACH 2 DONORS WILL HAVE THEIR NAME, CALL SIGN (as appropriate), RANK, and SERVICE INSCRIBED ON THE MONUMENT (up to 30 characters, spaces and punctuation included). This is so we can ensure your desired inscription information is correct! If donating by mail, please download the Monument FlyerTomcatMonumentFlyer_Nov2018 insert your desired information (up to 30 characters, including spaces and punctuation) and mail to F-14 Tomcat Monument Association, PO Box 3112 Virginia Beach VA 23454.